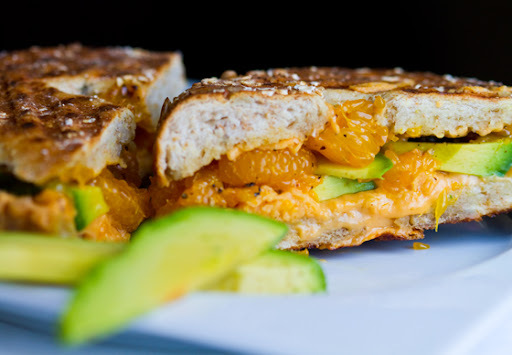 I'll file this recipe under "super easy" and "lovely flavors" - because that's just what you'll get when you serve up this crispy, cheesy, sweet and zesty bagel-wich. Perfect for taming a growling tummy quickly and deliciously.. 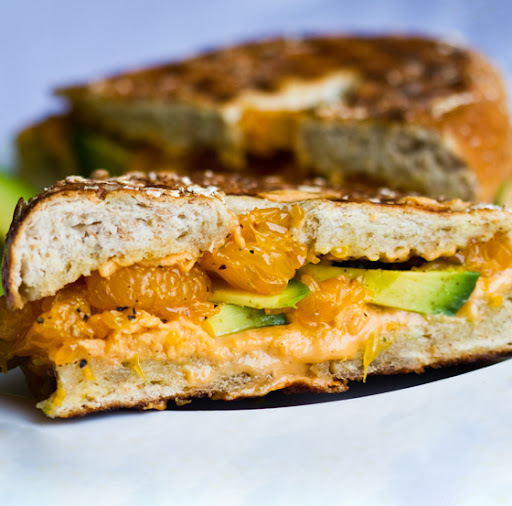 I'm really craving bagel-wiches lately - toasted on my panini press and oozing with Daiya cheese and glorious toppings. 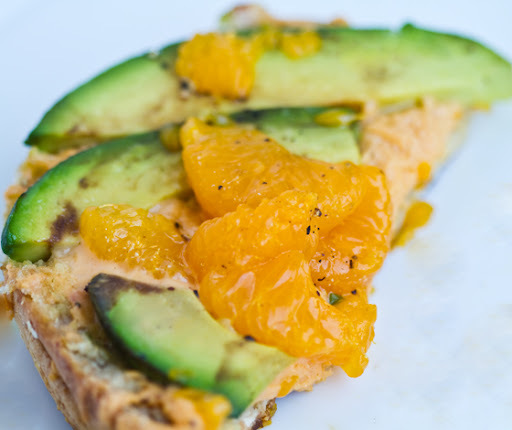 So I crafted this Sunny ManCado Bagel-wich out of two of my favorite ingredients: mandarin oranges and avocado. Only three ingredients stacked on a bagel means this recipe is terribly easy. 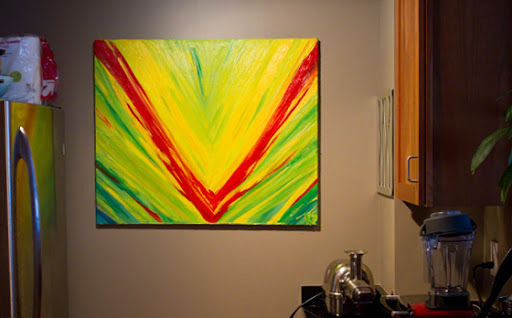 Grab this sunny day recipe - and check out my new vegan kitchen art!.. Of course I love fresh picked fruit - but I must admit that I have a thing for canned mandarin oranges. I always have them on hand. My fave mandarin oranges come from Dole - because they are packed in 100% fruit juice - unlike some other brands that use 'light syrup' - or even sticky sweet 'heavy syrup' - really, juicy sweet mandarins just don't need that added sugar! Or even worse - artificial sugar.. Yesterday I spotted a brand that soaked their mandarin oranges in splenda! And labeled them as "sugar free" - wha? Why would you want to soak luscious, natural canned mandarins in an artificial substance? Bleck. So I stock up on Dole. And toss them into easy recipes like this for flavor in a flash. ..and really, you can sub the canned mandarins with fresh mandarins - or any other fave fruit if you'd like. 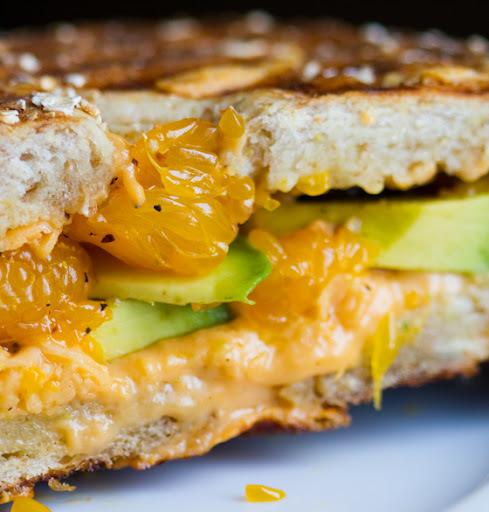 Just call this a Fruit & Cheese Panini to dream of. So go for it - get creative! Pineapple, apple, kiwi, pear, peaches, mango - so many fruits could be subbed into this bagel-wich - so you can make it again and again and never get bored. 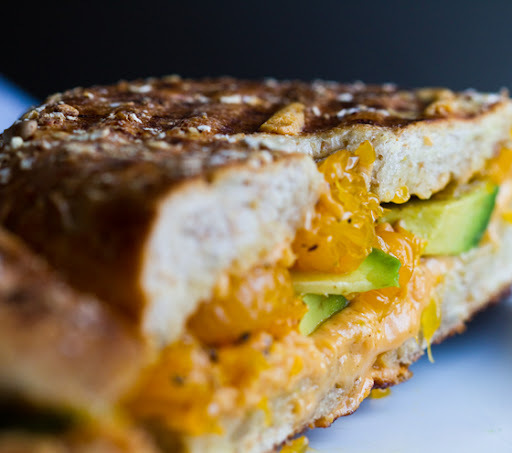 For that melty vegan cheese - I use Daiya vegan cheddar cheese shreds. 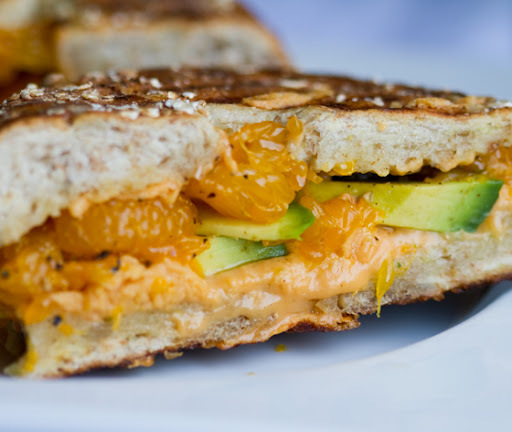 They melt perfectly and the robust cheddar flavor meshes well with the zingy citrus and creamy avocado. Salty and sweet, crisp and creamy, vegan cheesy and zesty. So many flavors and textures rolled into this easy recipe! Oh! And I finished my painting that I started last week. 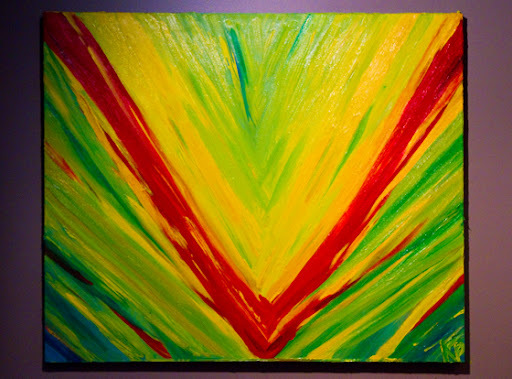 I have been wanting to do an oil painting of some sort of abstract "V" for a while now to hang in my kitchen. So I finally did this one. V for a vegan kitchen! (sorry the shot is a tad dark - I took it early this AM with no natural light yet)..
1. Slice your bagel in half and brush the insides with a bit of olive oil. 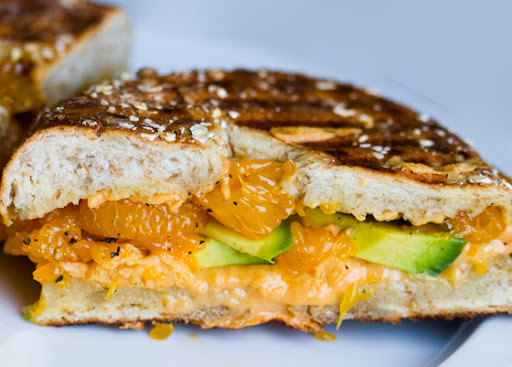 Place on your heated panini press (or grill pan) and allow to toast for a minute. 3. Allow to cook for about 3 minutes - or until you see grill marks and the cheese has melted. 4. Slice. Serve! I made a small side dish of leftover avocado and mandarin oranges to go along with this. Perfect with lemon or mint iced tea! See! Only three ingredients, but still so lovely. Simplicity is blissfully delicious.